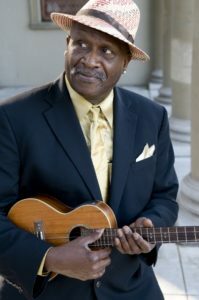 The musical conversation that has taken place between blues legend, Taj Mahal, and his audience, spanning over 60 years, has garnered the singer-sonwriter-instrumentalist an incredible amount of love and admiration. And it’s clear that the feeling is mutual. Growing up in a musical family, in a community with a thriving immigrant population, during the Harlem renaissance, has had a significant influence on Mahal’s unique style, which incorporates elements of traditional West African folk, jazz, Caribbean, Latin, R&B, calypso and Hawaiian slack key. Having carved out a unique niche for his upbeat, global fusion approach, the artistic contrarian illuminates a joyous silver lining to having the blues. He last appeared on Strawberry’s Main Stage in the spring of 1991. Taj Mahal’s return is sure to be a very special performance.